Breshad The Burner Perriman was born September 10, 1993 and is a wide receiver for the Baltimore Ravens of the National Football League (NFL). He played college football at the University of Central Florida. 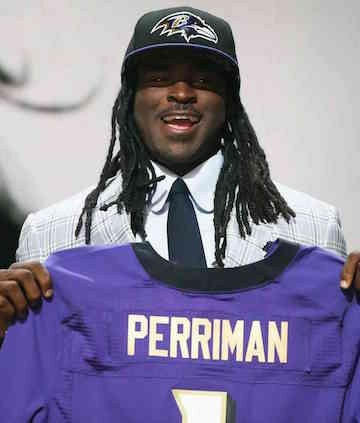 On May 11, 2015, Perriman signed a rookie contract with the Baltimore Ravens. The deal is reportedly worth $8.7 million over four years with a $4.6 million signing bonus. His father, Brett Perriman, played 10 years in the NFL. Football stars such as a Breshad Perriman have taken the game to new heights by excelling at their respective position. The booking agents at AthletePromotions can assist with Breshad Perriman speaking engagements or appearances from NFL stars. We have years of experience in booking gridiron greats for keynote speeches and autograph signings. Hiring a football speaker like Breshad Perriman is not a hard process. Our agents can provide availability, fees and all costs associated in bringing out a successful football star to your next corporate event. We can find Breshad Perrimans agent to make this booking happen. A Breshad Perriman appearance will add energy to your upcoming event and reward employees, customers and clients.Most likely, football fans and corporations can find Breshad Perriman's official website, charity involvement, Twitter account, representation, publicist and management info at www.Breshad Perriman.com.